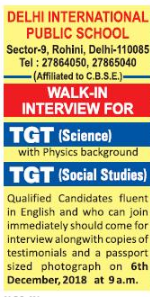 Delhi International School, New Delhi has advertised for recruitment of Teaching Faculty- Teachers TGT jobs vacancies. Interested and eligible job aspirants are requested to walk-in on 06th December 2018. Check out further more details below. About School: At DIS we lay proportionate emphasis on academics and co- curricular activities. We make best possible utilization of students' talents and skills by incorporating physical education in the curriculum, educational tours and field trips, eco drives and initiating DIS Times to bring out the creative flair of the students. The inculcation of such programs helps in the personality development of a child. How to Apply: Interested and eligible candidates are requested to attend the Walk-in interview along with CV, copies of certificates, PAN card, Aadhaar card and PP size photos to the walk-in address given below.